Alaska Airlines continues to check projects off its list of $100 million in statewide in­frastructure improvements the com­pany announced in 2016. The airline’s 2020 Great Land Improvement Plan calls for a new $50 million maintenance and engi­neering hangar currently under construction in Anchorage and upgrades to the 11 airport terminals the air carrier owns and maintains throughout the state, according to Marilyn Romano, Alaska Airlines regional vice president. That $100-million figure also includes the purchase of three 737-700 all-freighter aircraft intended to better serve customers’ cargo needs with scheduled freight service, part of the company’s investment in its cargo transformation plan. The new aircraft replace the airline’s five combination passenger-cargo planes. “Cordova, Yakutat and Kodiak are complete,” Romano said of the planned upgrades. Cornerstone General Contractors is working with KPB Architects on an expansion and complete remodel of the Ralph Wien Memorial Airport in Kotzebue, with completion scheduled for this summer. KPB will begin work on the remaining terminals — in Nome, Bethel, Petersburg, Wrangell, Barrow, Gustavus and Deadhorse — by 2020, the regional VP added. Upgrades to these remote airports can prove challenging. Only Deadhorse is accessible by a road, stretching more than 800 miles north of Anchorage at the end of the Dalton Highway. Making the upgrades now fits perfectly with the values of the No. 1 passenger carrier in Alaska. 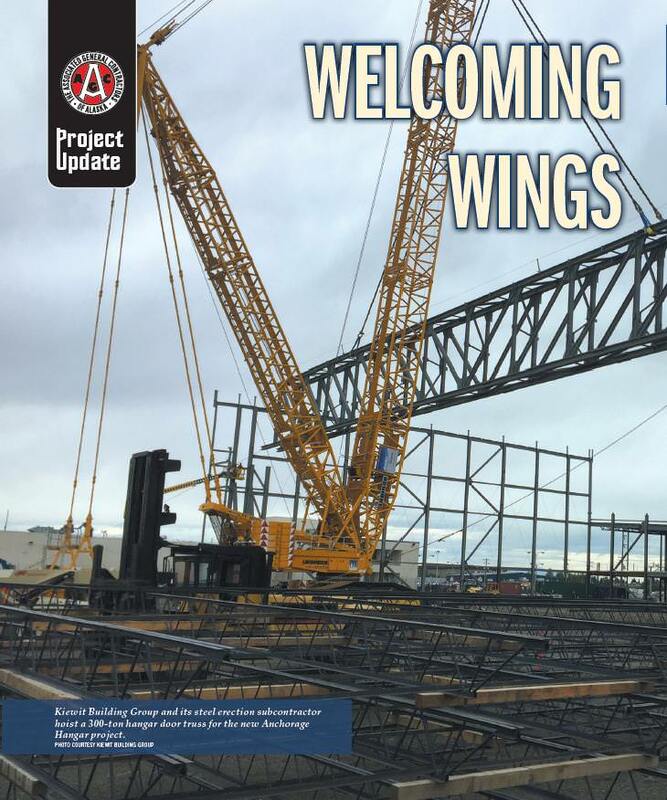 General contractor Kiewit Building Group Inc. began construction of the 100,000-square-foot hangar on the east side of Ted Stevens Anchorage International Airport in 2016. 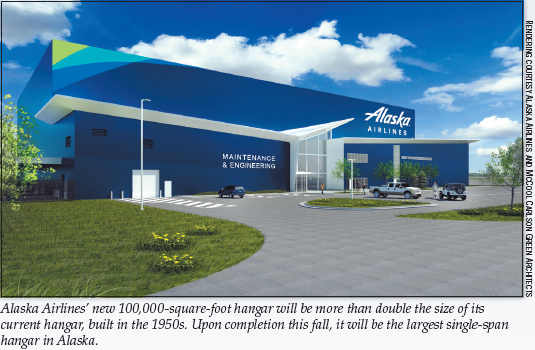 The new hangar will be twice the size of Alaska Airlines’ current 44,000-square-foot facility built in 1954 and designed to accommodate the then-modern Douglas DC-3 aircraft. 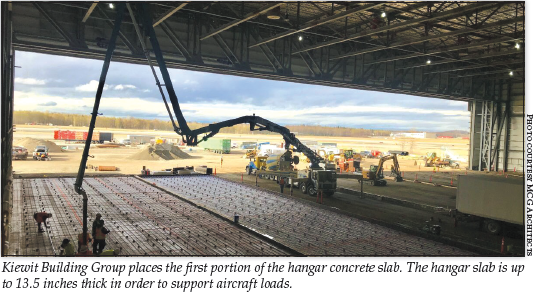 When completed, Alaska’s largest single-span hangar will be large enough to hold three Olympic sized hockey rinks and the height of a typical six-story office building, according to Aaron Steelman, project manager for Kiewit Building Group Inc. Approximately 465 craft, managers, designers, consultants, inspectors and other employees will work on the new hangar that’s set for completion this fall. However, a project this size has not been without challenges. Dealing with an older structure on airport property, the hangar team was prepared when contaminated soils were encountered. The team had consultants under contract prior to finding contaminated soils, as well as a plan to handle and stockpile soils during inspection and testing,” said Kiel Beloy, vice presi­dent and project executive for KBG. “The sorting and stockpiling of these contaminated soils did not negatively affect the project schedule,” he said. Another seemingly insurmount­able task was how to build and erect the 600,000-pound structural steel hangar door truss. Problem solved: After weeks of planning and engineering efforts, the huge truss was built on the ground and successfully erected in one section, Beloy said, thanks in part to the exper­tise of the entire project team. Kiewit Corporation is one of North America’s largest and most respected construction and engineering organi­zations, with nearly 70 years of expe­rience working on projects in Alaska. Anchorage based Cornerstone General Contractors and KPB Archi­tects recently completed the Kodiak terminal remodel and are now focusing on the Ralph Wien Memo­rial Airport in Kotzebue, scheduled for completion this fall. The Benny Benson State Airport in Kodiak received a complete remodel of the interior layout and upgrades to all the building’s systems, said Michael Cohen, project manager. Transportation Security Administra­tion screening operations were also upgraded to meet current standards. The Kotzebue terminal will undergo similar upgrades. Both projects present unique challenges, Cohen said. “The challenges of working in remote terminals are twofold: logistics and the unknowns,” Cohen explained. The most difficult aspect of the Kodiak project was not logistics. It was conducting work in an active terminal with no shutdowns in flight opera­tions. KPB Architects worked directly with on-site terminal personnel to maintain consistent airport schedules. Alaska Airlines has two incoming and outgoing flights a day out of Kodiak, and Ravn Airlines had up to six flights a day. “Each airline maintains a critical service to the island which could not be interrupted by construction activi­ties,” Cohen said. The unknown factor reared its head early on in the Kotzebue project, a village 33 miles north of the Arctic Circle on Alaska’s western coast. Diesel-contaminated soils were discovered and had migrated to the water table, Cohen said. Cornerstone and Alaska Airlines developed a plan to dewater the site in order to continue construction and remove and properly dispose of the contamination. Work is progressing to add 3,000 square feet of terminal space, rework the terminal’s interior layout, replace building systems and add a baggage carousel. Cornerstone has performed work in Alaska from Juneau to Barrow and is currently home to 20-plus employees and a statewide labor force. Nancy Erickson is a freelance writer living in Moose Pass.